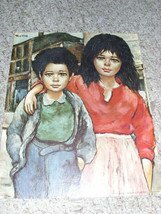 Roth litho print entitled "Brother and Sister" is in very good condition with very minor edge wear. The print measures 11" x 14" and the colors are bright and wonderfully vibrant. The print is on textured cardboard to give it a brushed effect and reads "D.A.C., NY P. 420 ROTH - BROTHER AND SISTER LITHO IN U.S.A." in small print along the bottom edge. Comes with a small wooden frame. Print is from probably mid 1960's.